I ran my first race in 2006, about a month after I turned 21. Above: In boxers (though it is hard to tell from this picture). Also... in this picture, I was pretty darn blind. I can see without glasses, but when I used to race without them, I would often squint. Honestly, it got nauseating at times. So at Tea Time's suggestion, I got contact lenses. Because of my astigmatism, my eyes need special toric lenses that spin around with the movement of my weird-shaped eyeball (which is the cause). They probably cost a little more than TWICE of normal contact lenses, and I can only change them monthly. Well, better than yearly, which used to be my only option. Yes, ONE PAIR of a whole year. Agh! 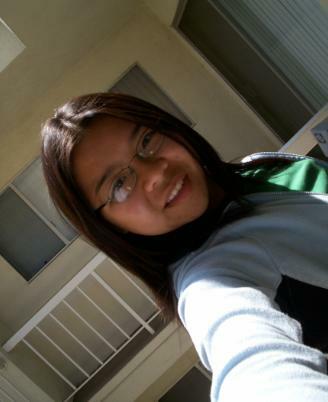 Above: From the balcony of my college apartment. For a point of comparison, here's a picture taken not too long after the (nerdy) above. 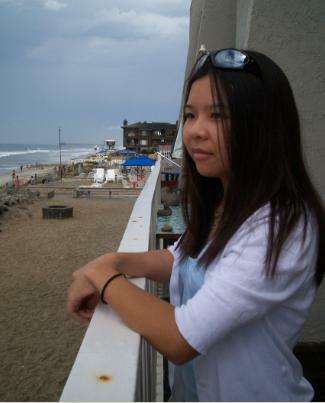 This shot was at my (now) brother-in-law's family's beach house... a couple of days before I started graduate school. I blogged about those sunglasses on my head here. Apparently, I've gone through many sunglasses! 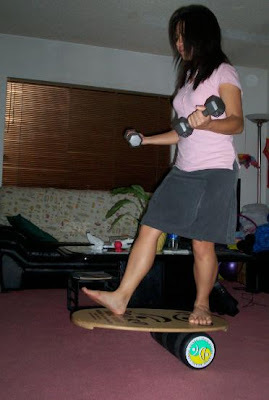 And for a short time in 2007, I was into Indo-Boarding. I bought one off of Craigslist and ended up reselling it on E-Bay. This was HIGHLY incompatible with running, with the obvious risk of ankle injury... But I think I was trying to prove my athleticism by doing some semi-extreme sport. Hah... like carpet is extreme, but oh well! 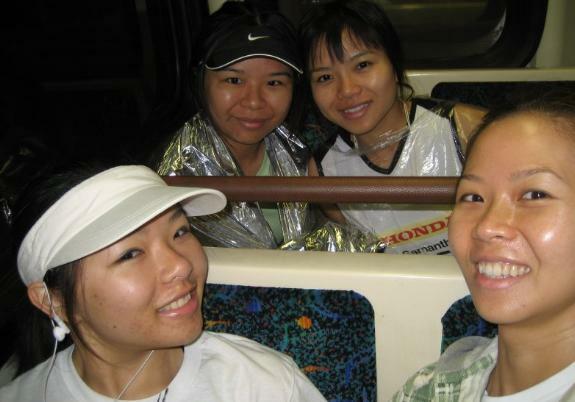 And finally, my favorite running time was when I ran LA Marathon 2008 with my sisters. This is a photo of us taking the subway to the start line.